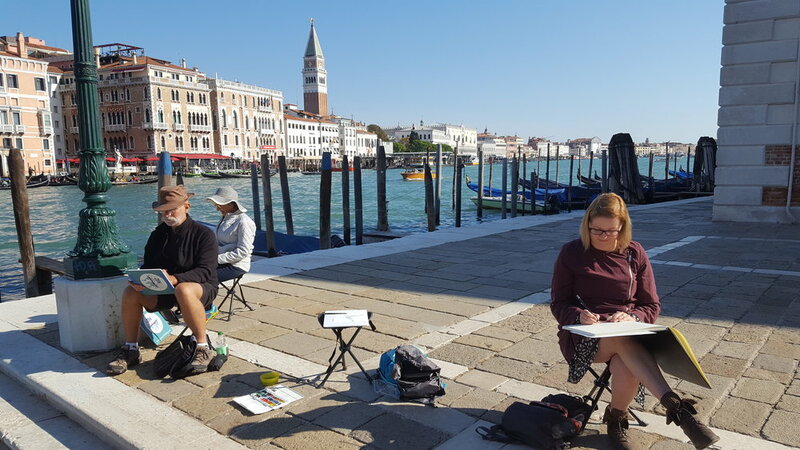 2019 PAINTING HOLIDAY VENICE ITALY | Group painting / drawing in the heart of Venice for a full week. Fabulous excursions in Venice and to 2 of its islands: Burano & Murano. This art holiday in Italy is suitable for all artistic levels. Large choice of art media: Watercolor, acrylics, oils, drawing, pastels, gouache. Sunday to Sunday. Accommodation in Venice. Equipment & Materials included. Great quality-price value. What's INCLUDED in our Venice painting holiday? Sunday to Sunday in the heart of Venice. 1 week of tutoring in a small group (maximum of 8 participants) exclusively in Venice and its islands. The tutor is Marie Remond. More on the tutor, painting techniques and teaching in our: Tutoring section. Accommodation: 7 nights SINGLE ROOM in shared accommodation among participants and tutor. Equipment provided. Stool, board, easel if doing acrylics or oils. Art materials included. Paint, paper, paintbrushes and more. You can visit our Equipment & Materials section. Fabulous excursions. Painting and sight-seeing in the HEART OF VENICE the whole week, plus on the Venetian islands of Burano and Murano. Airport welcome at Marco Polo Airport. ACCOMMODATION: Participants of the Venice painting holiday will stay at an early nineteen hundreds style villa in Venice, close to the water. 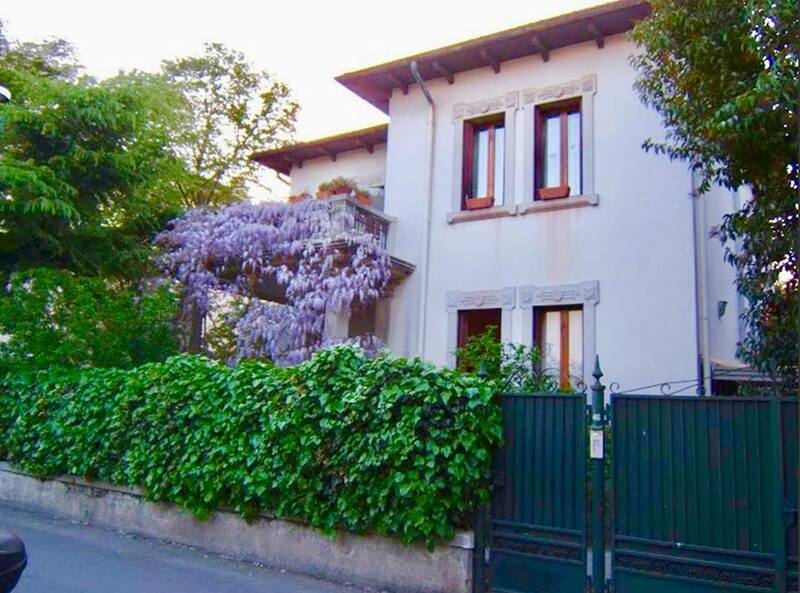 The house is in a quiet area of Venice, on Lido island, just 15 minutes away from San Marco Square by vaporetto (water bus). Day 1: In the afternoon before our first painting day, the tutor meets the group to welcome everyone at the airport at a set time. We'll get everybody in the right direction to buy their one week Venice vaporetto (waterbus) pass and head to the rental to drop bags off. When everybody's freshened up, we'll be off for dinner. Let the fun begin! Day 2: Group breakfast, introduction to the holiday by tutor where teaching and individual expectations are discussed. This is followed by a free morning, then lunch at a restaurant. We will start our ‘plein-air’ sketching and painting in the SAINT MARK'S SQUARE (ST. MARK'S BASILICA / DOGE'S PALACE / CAMPANILE) area, jewels within a jewel . Don’t worry, although this area is busy, your tutor will never ask you to paint in the midst of crowds. You’ll be able to choose different views, also facing the waters of the GRAND CANAL. When our day is over, we have our photo taken on the oh so famous BRIDGE OF SIGHS. Free time around 4, then dinner. Day 3: “At home” breakfast around 9, then we will visit the RIALTO BRIDGE and ACCADEMIA BRIDGE, Venice postcard views that guests love seeing and recognize immediately! Those wishing to join the group solely in the afternoon can stay at the rental. After lunch, group and tutor head for SANTA MARIA DELLA SALUTE CHURCH which they’ll be able to visit for free, and then sketch and paint the very beautiful multi-facet exterior until about 4.30. Free time, then suggested Spritz and group dinner at the very romantic Bar Foscarini, a pizza restaurant just beneath Accademia Bridge. Day 4: Breakfast, free morning to shop, wander around or finish some art work. Lunch. That afternoon session is spent in the lovely and quiet area of the VENICE ARSENALE where group sketches and paints/draws until about 4.30. Then a trip to LIDO ISLAND (about 10 minutes of Vaporetto) will be suggested for dinner. Day 5: After breakfast, the group will be off to visit the MERCATO DI RIALTO. We’ll then have lunch in the area. In the afternoon, we will visit and sketch the SCALA CONTARINI DEL BOVOLO, a marvel of architecture; stairs leading to a nice Venice of Venice. Free time around 4.30. Dinner. Day 6: Breakfast, free morning. Lunch at home. In the afternoon, the group will head for the lovely and quiet area of DORSODURO where the view will make the artist in you chant. Sketching and painting/drawing there for the afternoon until about 4.30. Free time. Dinner. Day 7: Breakfast. Then group and tutor will head to world famous MURANO to watch glass blowers in action at the glass factory workshops! After that fun morning, we’ll be off to close-by BURANO island for lunch and where group painting/drawing is planned in the afternoon. Burano is a treasure made of strings of colorful islands nested among the Venetian islands. Back to Venice around 5. Free time, dinner. If you’d like to contact us by email about our 2019 Venice painting holiday in Italy, simply fill out the form. I'd like to be contacted by phone to discuss this holiday. Yes, please. No, thank you. Please note we will be taking vaporettos (water bus) to virtually all of our painting sites. Although you do not need to be an athlete to join this painting holiday, you will need to be able to walk without strain at a normal no-rush pace anywhere from 15 to 20 minutes at a time to get to places. Scala Contarini del Bovolo: Participants wishing to stay at the bottom can paint/draw from there. Preparing your art trip. Things that are not included: Getting to Venice, meals (budget depends on what you order etc., you can also make some ‘at home’ meals at the condo), Vaporetto bus pass (£50), entry to Scala (£10). Welcome to our Venice painting holiday workshop and to the world’s most captivating 17th century setting, where the streets are made of water. Breathe in Venice, and... breathe it out slowly. Take a delectable dive in this art holiday. Abandon yourself to your brushes or pencils in the most famous live open-air decor set 400 years ago. Paint Venice in its very heart for the whole of your holiday. Our fabulous Venice excursions include close-by Venice islands Burano and Murano. Interested? you can fill out the form above or go to our Prices & Bookings page in the top menu for immediate bookings. We offer a painting /drawing open-air class in Italy, in one its most remarkable, ageless and timeless cities. Small group of like-minded people. Beginners to advanced levels welcome. You've been looking for a holiday or vacation where you can paint or draw? * Those wishing to enjoy an evening show at LA FENICE theater as a group outing should let us know. 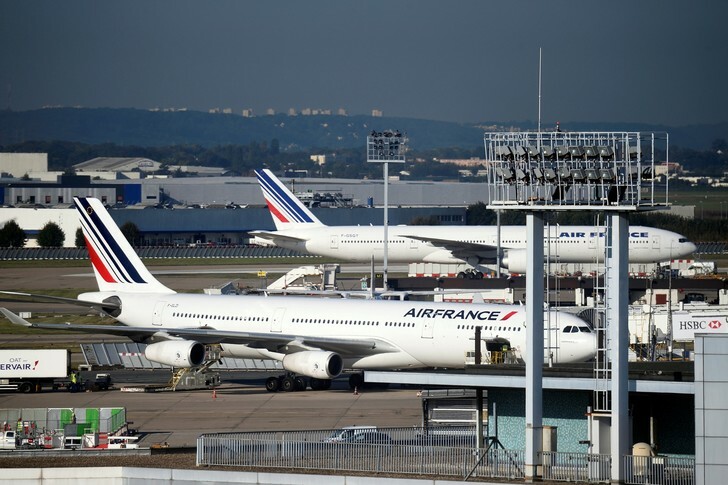 How will we get around? With a weekly Venice Pass by vaporettos (hop-on hop-off bus boats) and by walking. Lots of tiny streets in Venice (some funnily narrow!) and quite a few mini bridges with steps on them to cross tiny canals. You should be prepared to walk, but the pace will be easy and relaxed. What if I'm a beginner, won't Venice be too complicated to paint or draw? Not to worry, the tutor will have you concentrate on fewer subjects and take it one step at a time. About group lunches and dinners, mostly sit-down lunches with maybe a sandwich lunch by the water, depending on what and where we're painting. Dinners at local places. Please note that you are free to go your own way if you wish to. Also, if you would rather continue painting and take a quicker lunch break, that's fine too. Different central sites to be painted every day, a helpful tutor, artistic togetherness and fun with your group! Anyone who’s ever been to Venice has never forgotten it. As soon as you step into it, you are under a spell of enchantment, where even the light seems to be different. It's far from being sappy or over-rated. It is simply a painter’s absolute paradise, where what seems to be allusion or allurement is actually real life. You’ll easily imagine Casanova or Canaletto taking gondolas in the canals, crossing bridges, their capes flowing about, taking in the beauty of the famous Piazza San Marco, Rialto Bridge and many other landmarks. Being there, painting and sight-seeing, you are guaranteed to feel that you're an exciting part of it. Venice embraces its visitors. Painters leave with their personal art work, their heads full of fantastic memories. Non-painters are never bored, and always wish they could stay much longer to see it all! But Venice is also about relaxation and culture. Our small group takes time to enjoy every morsel of the holiday. There is no set time schedule per say. Only rounded guidelines, to get us painting again after a canal view lunch, for example. ‘Plein-air’ painting holidays are by definition full of outings. Excursions on this Venice holiday are special day trips where we'll head out a bit farther into the Venetian islands: Burano and Murano. Burano is a small Venetian island known for its colorful houses, delightful to paint! Murano is a world renown island known for its talented glass blowers. We'll visit the glass factories. 1 week with 6 fulls days (2019) or 5 full days (2018) of tutoring with a caring and friendly tutor. Let's not take the ZEN out of Azenart! It's your well-earned Italian painting break, and you've earned it! Your tutor will lead the art group to delightful, picturesque sites every day. You will learn basic and new techniques. If you are a beginner, the tutor is there to teach you A to Z painting, or simply guide you if that is your preference. If you're a confirmed artist on this painting trip in Venice, the tutor is at your service to answer any questions you might have, but also teach you new tricks. Sketching and painting/drawing is planned outside, in the heart of the art. If weather conditions make that difficult, there are always fun temporary indoor alternatives. Art materials provided. More on this in our Equipment & Materials section. We'll be doing watercolors, but you are free to do any drawing media (soft pastels are not recommended as they are volatile), acrylics or oils, hard pastel, gouache... Please note that oil painters will be required to bring a wet canvas carrying case and will be asked to be extra careful in the accommodation (staining). Stool, board or easel are at your disposal for the duration of the stay. Group airport meeting and welcome by the tutor. Please note that you can book your Venice painting/drawing holiday with an online deposit of £175 (+-$230) if event is 60 + days away, and if sooner by a full payment of £390 ($+-500) + accommodation. 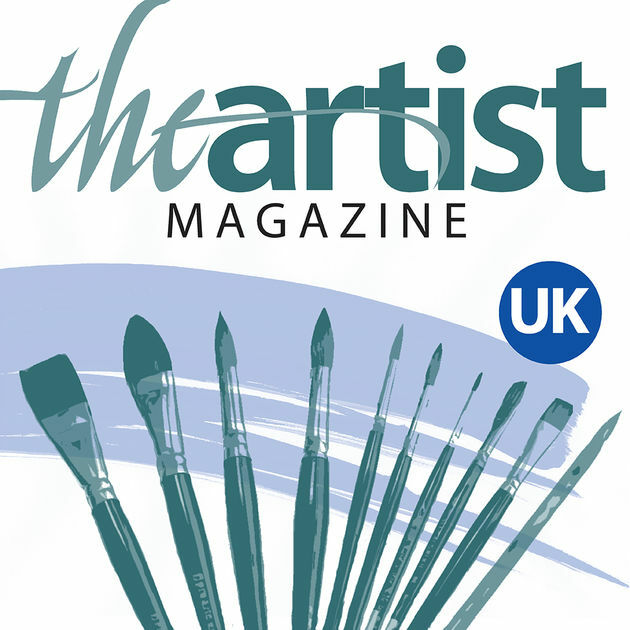 Azenart Painting Holidays are now featured in the Artist Magazine, Leisure Painter, and on Painters Online. This Venice Italy art holiday is a watercolor holiday, but also an oil painting holiday and acrylics art holiday, and is generally called a multi-media art holiday.